Be sure to stop by Ibex Outdoor Clothing on Newbury Street in Boston this summer to see our Honey Cyclocross Race bike on display. 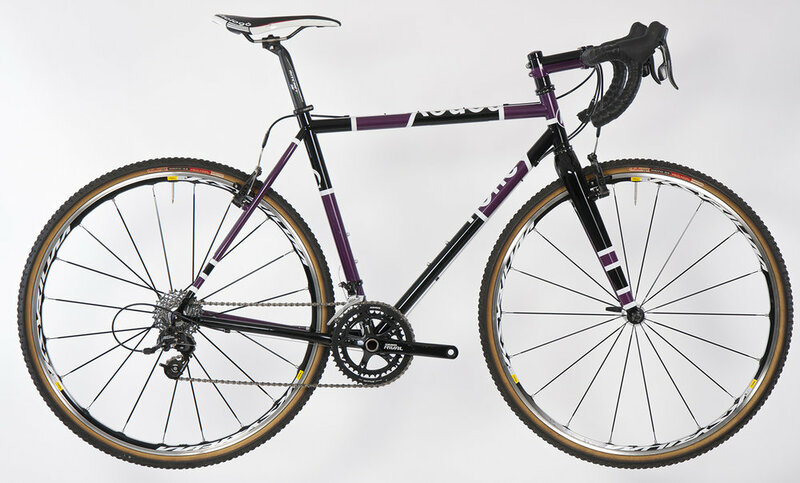 This bike is perfect for the upcoming CX season. We designed the Honey Cyclocross Race specifically for contemporary American UCI 'cross racing with it's quick handling and tight geometry. This race model can handle pavement, wooded trails, grass, steep hills and obstacles and keep you moving fast through the course. The frame and fork will fit up to 40c tires while maintaining excellent mud clearance. This bike is also unique because we've designed a limited edition paint scheme that highlights Honey's paint skill. The colors are amethyst, white, and black. You'll be highly visible on the start-line and at the finish - whether the bike is covered in mud or not. The paint design is only available through the end of this year. Why this bike? Designed specifically for US style race courses that are right, technical and enjoy lots of accelerations. Steel provides a feel and control not available in other materials- and this steel frame is weight competitive. This bike will push you to ride harder. New tubeset for 2015: four ounces lighter than last year. Brake system options: this bike is set up with the lightest weight brake system. Disc brake options are available. Fits UCI legal 33c tires with generous mud clearance for the toughest New England cross race courses. Limited Edition Paint Scheme: This is one of our special schemes for the current season. We're excited to have our Honey at ibex on Newbury because we love their gear. Ibex Outdoor Clothing is a designer of year-round merino wool outdoor clothing and cycling apparel, founded in the belief of the superior natural performance properties of wool. Ibex has been known for its Duo bike shorts for over a decade. With a form fit mixture of spandex through the seat and inner legs and lightweight Merino wool throughout the remainder of the short, it provides for natural breathability and temperature regulation. We look forward to a great CX season ahead and especially look forward to seeing one of our favorite Ibex sponsored teams, The Drifters, out on the course.